I know it has been forever since I updated my newsletters. I haven't been sending out my postal service newsletters, either. This economic slowdown has been difficult for all of us. My favorite foundry has been a casualty, too. I had to locate another good foundry, and yes, I did. Kalispell Art Castings has been in business for a long time and does excellent work. Of course, three and a half hours and two mountain ridges is a bit different from 30 miles, but the drive is lovely into Montana. "The Sentry", my new wolf sculpture, is at the new foundry right now. Yes, the pre-cast special price is still in effect. 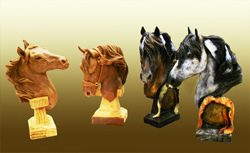 And I am doing a selection of small collectable horseheads [see photo on left], and they will be ready for Christmas delivery if ordered soon. The pre-cast on "Windy" the wax on the far left is $250. The cast figures on the right are "Young Warrior's Horse" are going to be ready (those as shown have already sold) and available for $350. The central wax, "The Best One" is not at the foundry yet. Things are going well here at the home place. The garden did fine even after a late Spring, and the apple crop is heavy, though the apples are small. It takes a big bucket to slice and fill the dehydrator, but we are working on it. The rest of the smaller apples are keeping the deer and mules very happy! Also Romeo, for those who don't know, he is our new young Fjord gelding who needed a new home last winter. What a lover. He really would follow us into the house if we would let him. He has been in training to ride and drive, and we do hope to have the cart shafts both back pointed in the same direction by next Spring. No one was hurt in that hitch attempt, but I do think he has potential as a racing chariot horse. He really wasn't that upset, surprisingly, once he got rid of the tangle and Emmette is certain he can put the harness pieces back together. Sometime this winter. After he rebuilds the cart. It is a good thing that not only does he do leather work but he and his sons all weld, too. I won best of show sculpture at the Historic Ritzville Days Western Art Show this May. I feel very honored. For those of you in the Washington Idaho area, do try to make the show this coming May. There are many very fine artists that attend this relaxed fun outdoor show, yes, there are even shoot-outs on Main Street for the kids to enjoy. Also cowboy poets and singers. Mark your calenders for Saturday and Sunday Memorial Day weekend, and look for the posters. They have asked me to be this year's poster artist. We still attend the Ellensburg National Western Art Show, and for something different, The Event at Rebecca Farms in Kalispell Montana. Some of the nation's best horses compete in this Three-Day Event, and quite a few fine artists also display in the Exhibitor's Tent. We are still filling the year's schedule. We do regret we won't be able to attend the Colorado and Texas Indian Markets, they are such great shows. I am going more and more to e-mail contact with my collectors and those others of you who are interested in my work. I would like to be able to contact you directly when I finish a new piece as well as send you my latest e-newsletters. Just send me your e-mail address and you will get special previews, and maybe once in a while even a select very special offer. I am really looking forward to developing a way to let you know immediately what I have done and I'd love to be able to answer your questions and hear your comments back just as fast. If I can't see you in person, then I hope this may be the next best thing. Of course, you can still call me, 208 265 9613 as well as gabegabel@hotmail.com.